THE CANOVANOGRAM RESEARCH PALEOANTHROPOLOGY REPORT. 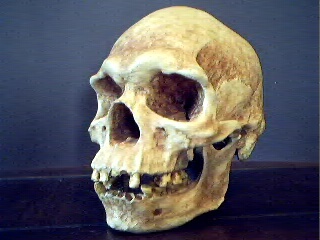 The controversial Pintubi-1 skull of Australia (pictured above) is a paradox of paleoanthropology. 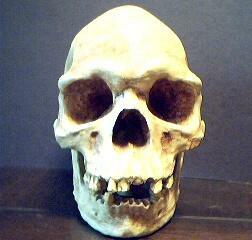 As a hominid fossil, its so young that it has been assigned to a tribe that survived into the last century. 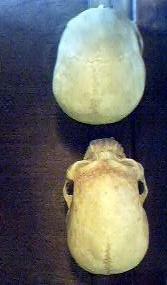 A modern aboriginal skull. Yet its morphology could be described as archaic. very recently (in paleo-terms), likely in the 1800s or later. It is in perfect condition and shows no signs of antiquity. 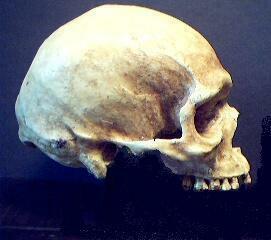 The skull was discovered or obtained around 1905 near the lower Darling River in New South Wales, Australia. Beyond that, all we are able to determine is that it is said to be a large adult 50 year old male from the Pintubi tribe. The last of the Pintubis (also called Bindaboos) surrendered their nomadic Stone Age life styles in the 1960s. They were probably the final example of unaltered stone age culture in Australia. They were an incredible people who could live under the most unlivable conditions ever encountered by humanity. Their culture, simple at first glance, was incredibly complex as was their intimacy with their surroundings. Scientific speculation of Australian aboriginal ancestry has lately gotten bogged down with the Out of Africa vs. Multiregional Evolution debate. Almost universally accepted is the Out of Africa theory which states that fully modern man emerged out of Africa only 100,000 years ago, spreading across the globe and wiping out the (obsolete) archaic humans. Out of Africa insists that early human species such as Homo erectus and Neanderthal became extinct - evolutionary dead ends - and had nothing to do with the development of Homo sapiens. That we are, therefore, all descended from this recent wave of African humanity. The not so popular multi-regional counter theory suggests many regional pockets of gradual evolution throughout the old world with emerging races or groups of humanity - groups that would remain closely related through constant migratory or cross fertilization. This globular gene flow would keep the entire group together as it evolved over millions of years. Employing the multiregional scenario for the origin of the Australians, scientists have used fossils to demonstrate a continuity beginning with Asias classic Java man through Ngandong (Solo Man), Wadjak and on to Austalias present aborigines. Much of the evidence for tracing them back to South East Asia and all the way back to the extinct Indonesian archaics has been the cache of recent fossils in Australias Kow Swamp locale. 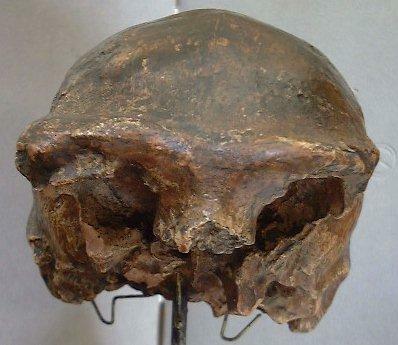 They were initially described as very reminiscent of Javan Homo erectus. But a strong case was made of the likelihood that artificial deformation was responsible for their seemingly robust and primitive appearance. Even though many of the specimens did NOT show signs of deformation, they all became tainted with the label and were relegated to an area of relative unimportance. The fact that these Kow Swamp bones were estimated to be only 20 30,000 years old added to their seeming incongruity, the vintage being much too young. And of course, a sensitivity to racial considerations made the subject all the more difficult if not taboo. Only recently has sensational evidence come to light that may force scientists to re-examine this issue and tilt the scales on this human evolution debate. (1.) 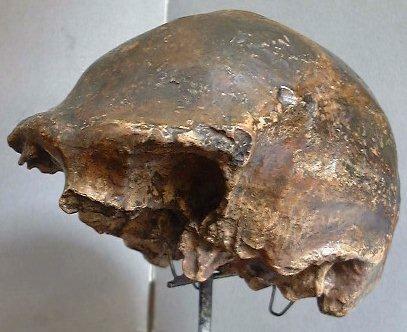 In the last couple years, it has been established that the Solo River (Ngandong,Java) variety of late Homo erectus may have survived to as a mere 30,000 y.a. (years ago) in Java. It had previously been thought to be extinct for a hundred thousand years or longer. This prompts the revelation that Homo erectus and Homo sapiens could have existed on Earth (and in the same region) simultaneously. (2.) Prehistoric cave paintings have been discovered at Australias Jinmium . Some tests indicate they might be 120,000 years old. Australia had previously been thought to be inhabited by humans for perhaps 40,000 years. (3.) Traces of what have been percieved to be man made fire have lately been documented and dated at 100-150,000 years. (4.) New regional testing of human mitochondrial DNA has indicated that the oldest sequences or versions of the human gene are coming out of Asia and Australia (not Africa as expected) with dates of 200,000 years ago. The sum of these addendums would indicate human habitation in Australia before the wave of African humanity could possibly have gotten there. 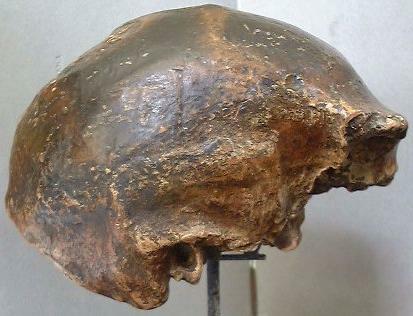 It also indicates that Homo erectus may be the first sea farer by forging the strait from Asia to Australia ( if Man inhabited Australia 200,000 y.a., Homo Erectus was the only model available!). These stated developments are not fully tested but are certainly sending a buzz through the paleo-anthro community. All this, coupled with the fact that occasional Kow Swamp characteristics are still observed in some present day aborigines lends credence to the argument that the multiregional S.E. Asian ancestry scenerio has renewed validity. The evidence is intriguing. The subject skull, modern in age, yet archaic in structure is a relevant example and deserves the following brief description. 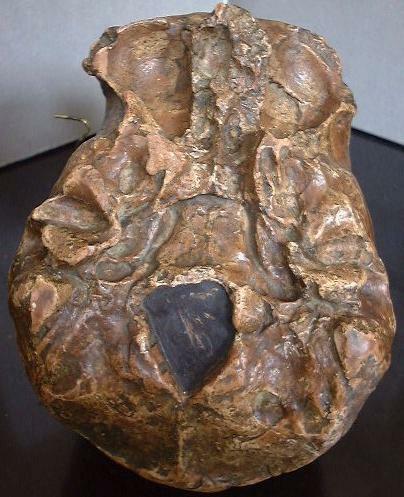 Even if a pathological oddity it would demand attention but an anthropologist at the University of Michigan assures us that this is not the case and that this specimen isnt that unusual. The present proprietor of Pintubi-1 (Canovan Researchs designation) for study is not known. An excellent cast was supplied by Bone Clones Inc. (http://www.boneclones.com/) for this description. Excepting its missing teeth, the skull is complete and quite robust. Quite long and somewhat low, its general measurements include a total length of 8 ¼, by 5 ¼ in width, and a height of 8 ¼. The moderately low vault has a marked frontal slope with a well developed saggital keel along the midline. 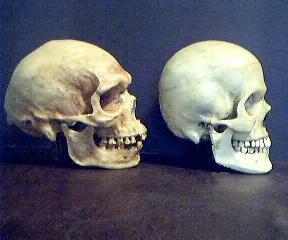 Despite the dramatic contours, there is no hint of artificial cranial deformation. Although cranial capacity remains unmeasured, the vault appearance doesnt indicate anything of obvious note with the possible exception that it appears large. A nearly unbroken but fairly well developed supraorbital torus is very evident. Its development and prominence is complete over the nasal area (medially) but has a more gracile lateral portion. Also notable is the distinct nuchal torus (occipital bun) at the rear area of neck muscle attachment. Measured horizontally, it is a good 3 ½ and very pronounced with much expansion at the center. Above the torus is a well defined groove. There is some thickening and angulation at the temporal lines. The pentagonal shape of the vault from the rear is quite remarkable. This same view does not show an obvious maximum vault width at the top or at the bottom but callipers give a slight edge to the bottom (5 vs. 4 ¾). Top view indicates a well defined post orbital constriction (calipers indicate 3 5/8 front vs. 4 ¾back). Orbits are quite square and nasals are recessed at base as in typical australoid morphology. The zygomatic flare is very wide and pronounced. And the nasal aperture is notably broad. The face is large, wide and forward projecting (prognathic) with very large maxilla. The palate measures 2 7/8 in width x 2 ¾ long (roughly equivalent to pithecanthropus IV). By comparison, our (pictured) typical Euro-male sample measured 2 3/8wide x 1 ¾ long. All teeth are exceedingly worn but massive. The molars are exceptionally huge. Most upper teeth are present. They include all 6 molars, the 2 right pre-molars, left canine (massive but worn at line of occlusion), 1 lateral right incisor heavily worn, and 2 partial but heavily worn central incisors. There does not appear to have been any diastema (gap) between canine and incisor. right) canine. 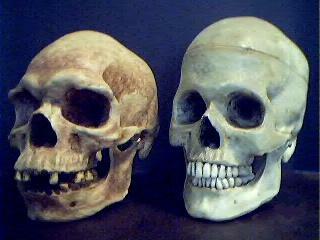 All intact and all radically worn at occlusion. All four lower incisors are absent. In both lateral views, there is an obvious gap between the third molar and the front of the ascending ramus. 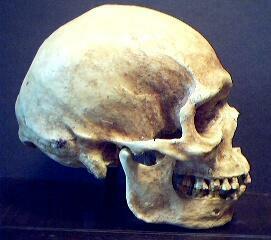 Ramus of mandible is moderately wide but somewhat gracile when considering the robusticity of the general skull. Mental eminence (chin) is moderately weak with minimal forward projection. Although we are describing differences that might seem to approach speciation, we must remember that these are differences in grade only. Affinities suggested by these descriptions are all Homo sapiens, to be sure. Let no misinterpretation be made here. There is, however, enough variance from the norm to suggest some carry-over morphology from earlier or archaic anscestry. A continuity or link to the past, as it were. 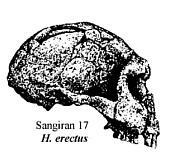 The link might be inferred to the influence of robust hominids of late Pleistocene Asia. The obvious candidate for this backward probe would be the aforementioned Homo erectus Soloensis of Ngandong, Java. In a previous investigation, I was able to inspect casts of 2 calvarias - a 20,000 year old Australian aborigine (WLH-50) and an Indonesian (Ngandong, Java) Homo erectus Soloensis and was amazed at their nearly identical proportions. This same Javan Ngandong sample will be shown in the photo section for comparison to Pintubi-1. The photographs are the meat of this essay. They are the evidence that allow the reader to make his/her comparisons and judgements. 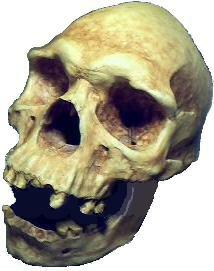 Is this skull an argument for gene flow and continuity pointing back to ancient Java? It would seem so for this writer. It is hoped that the scientific community will fully recognize the data discussed here. Perhaps an official and full description of Pintubi-1 can be published. We are graced by a unique, endangered, and valuable people in once isolated Australia. They have always deserved better. As they return to their dreamtime, one would hope they finally receive recognition and dignity. Now on to the photos below. 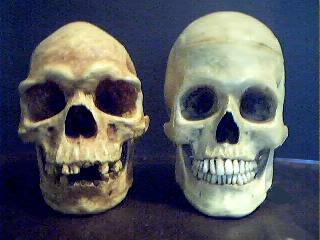 Solo-6 calvarium cast, frontal (late Homo erectus,Ngandong Java)"Solo Man"
S-17(classic Indonesian Homo erectus, Sangiran java)"Java Man"
Pintubi-1 compared with average modern. 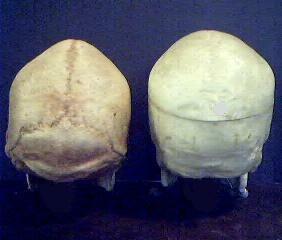 Note contrast of morphologies. Lockwood, Douglas: The Lizard Eaters,(Pintubi culture), Cassel Melbourne, 1964. Wolpoff, Milford: Paleoanthropology, 1980, Alfred A. Knopf, N.Y. Please get in touch with any comments or reactions to our site.